Have Western Liberals been in Bed with Radical Militants for Far Too Long? Lately we’ve been witnessing an ever increasing number of reports and non-conspiratorial facts that expose an alliance that exists between Western liberals and jihadists. It’s hardly a secret that in Libya NATO fought a war on behalf of al-Qaeda and other radical groups to topple the legitimate government of what used to be the most prosperous and stable African state. Countries like Britain even used their intelligence services to help bring latent jihadists, some of whom were under police surveillance, in a bid to topple the government of Muammar Gaddafi. Even today such states as the United States, Britain, France, Germany, Netherlands, and Belgium are not just sponsoring radical militants across the Middle East and arming them, they are effectively providing close air support to radical forces in Syria, while helping the Saudis to aid the Wahhabist cause in Yemen. ISIS and al-Qaeda want to destroy secular, progressive, modern Arab governments whether Ba’athist, Nasserist or in the case of Libya one based on the Third International Theory–western leaders want the same. Jihadists believe it is their duty to replace secular governments with theocracy–western leaders back them up. Countries like secular France, Israel, Germany the US and UK don’t like to talk about the fact that Libya was a secular state with mass literacy, women’s rights, protections and safety for black people and high living standards. Western government have been providing all sorts of assistance to radical terrorists right under our noses, acting on the pretext that they are assisting non-existent moderate rebels groups. In reality certain detachment of ISIS would pretend to be member of the so-called opposition forces in the morning, only to butcher civilians by hundreds in the evening. It comes as no surprise that recently the Salon magazine would publish a detailed report of the crimes against humanity committed by the so-called ‘moderate rebels’ in Syria, since there’s a long list of those being committed on the daily basis. 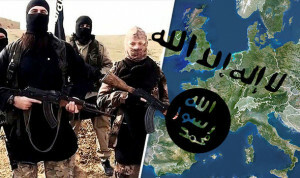 The efforts undertaken by governments, special services, civil society institutions of the Western world to support those so-called ‘moderate forces’ will inevitably lead to the continuation of the string of terrorist attacks in Western states, leading to the ever growing hatred that most Europeans have recently experienced towards Muslims. The divide between various social and religious groups across the EU will become even deeper with every new terrorist attack. This development will transform those Muslims who have nothing in common with radical militants into outcasts, that are going to be unwelcome in most any European state. This will make the attempts to radicalize those groups that are being routinely taken by ISIS into a pretty simple task. This means that after some time the Islamic State will become capable of enlisting enough outcasts to create a rouge army in the EU. The question is where will this army launch a jihad against the infidels in the Middle East or in Europe itself? The ideas voiced by certain individual experts about the need to put an end to the exodus of Muslims from the conflict zones in the Middle East and North Africa look delusional at best. Judge for yourself, no European state will agree to invest massive financial resources in the rebuilding the destroyed economies of Syria, Iraq, Afghanistan, Yemen, Somalia, in a bid to create more or less decent living conditions for local residents that are fleeing their home towns in search for a better life in Europe. Therefore, the ongoing fighting in those regions will only lead to an increase in the level of radicalization among local young people, who forced into exile and deprived of the decent and humane treatment that any individual is entitled to get. The programs aimed at the de-radicalization introduced by a number of EU countries, in fact, are not only falling short of the expected effect, but just fail. This is especially true of the program of de-radicalization of French youth, that was adopted last May. Its failure is being manifested by the reports of two members of the French Senate: Esther Benbassa and Catherine Troendlé. Those ladies drafted a document that goes under the title of “Désendoctrinement, désensbrigadement et réinsertion des djihadistes en France et en Europe.” In short, this report subjects the attempts create centers of to deradicalization taken by the French government to an extensive amount of criticism, since local authorities have not simply failed to achieve their stated goals, but compromised the very idea of creating such centers. Therefore, it is only logical that an ever increasing number of experts in various countries of the world has come to grips with the fact that the military defeat of ISIS in Syria and Iraq will not put an end to the string of terrorist attacks in Europe. That is why the problem of radicalization is, above all, the problem of European societies, and it must be solved in Europe. The Die Presse, for instance, seems convinced that it’s the only hope the EU has to put an end to the problem of terrorism. For Germany, the defeats that the Islamic State is suffering in Syria is major security risk, since the more pressure is exerted on jihadists, the higher the threat of terrorist attacks in Western Europe, notes Christoph Wanner, a correspondent for the German TV channel N24. That is why today the European political forces, just like their colleagues from across the ocean, must take decisive efforts in a bid put an end to radicalization of local Muslim communities and counter the spread of ISIS’ poisonous ideology.